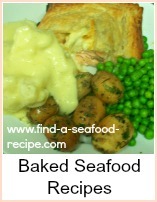 This baked salmon recipe is so simple and quick to prepare. Salmon is full of the essential fatty acids that are good for you. EFAs are important for the development of the brain. 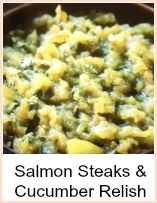 They're also good for the heart - be heart healthy and have oily fish twice a week. Baking is a very simple way of cooking. If you've got a dinner party, then it's simple to prepare this dish, refrigerate it, then cook it at the last minute. Allow an extra 5 to 10 minutes if cooking from chilled. It takes just 15 minutes in a hot oven, so you can get everything else underway and cook this last. Take a plate or shallow dish and mix together the flour, thyme and black pepper - use as much as you like. Dampen the fish with lemon juice, then coat evenly with the flour mixture. Put the salmon onto an oiled baking tray - make sure it's big enough to take the salmon in one layer. 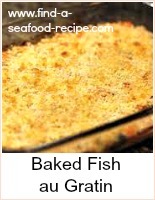 Bake in the oven for about 15 to 20 minutes until the fish is cooked through. The salmon should be firm to the touch when you press it. Serve this with some crushed or buttered new potatoes and a salad or some buttered asparagus spears. It's a quick and easy method to bake salmon without a lot of fuss and mess. Salmon is really the king of fish and shouldn't be messed around with too much - just something sharp (in this case, lemon juice) to cut through the oiliness is sufficient - nothing to dominate the flavour. 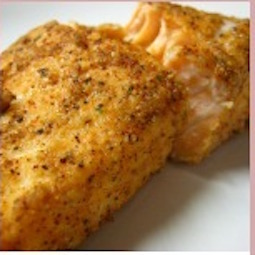 A very easy to make baked salmon, with a herby coating. Best served simply with some buttered new potatoes, a salad or some vegetables. Super quick to prepare.